In recent years, the global business and trade landscape has been abuzz with dialogue about China’s One Belt One Road (OBOR) Initiative which aims to connect major Asian and European economies through trade, infrastructure, and investments. 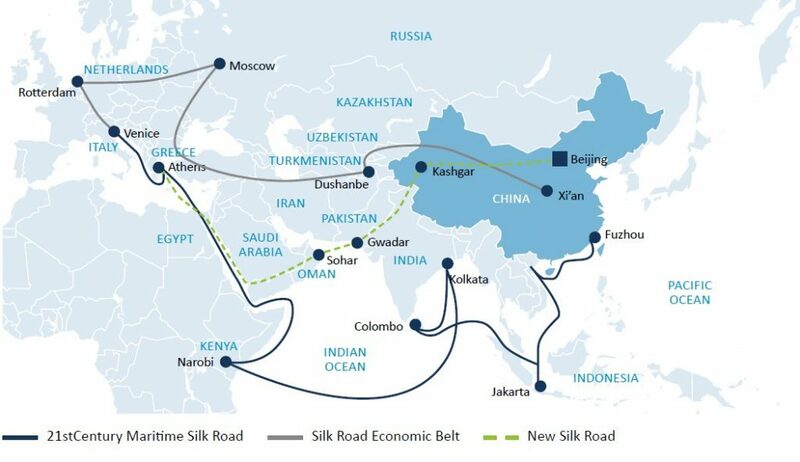 OBOR has been visualized by the Chinese government as an ode to the Maritime Silk Trading Routes of yesteryear that helped connect traders from regions such as China, Persia, and the Roman Empire. China has designed OBOR primarily as an economic tool to help re-shift its surplus domestic industrial overcapacity, transform from a merchandise exporter to a capital exporter, stimulate trade connectivity, and diversify its energy projects. The sheer geographic scale of OBOR which will require the participation of 70 countries and encompass two-thirds of the world’s population justifies its USD 1 trillion price tag. In lieu of participation, Chinese state-owned firms invest in the infrastructure of the shortlisted countries. Some of the most recent noteworthy investments since the launch of the initiative in 2013 include COSTCO’s investments in European ports in Belgium, Greece, Spain, and Italy, giving it control over one-tenth of all European port capacity; and China Merchants Port Holdings investments in Sri Lanka, Djibouti, and Brazil, in conjunction with earlier acquisitions in Europe. China’s alliance with the GCC region has strengthened in the recent past. The relationship between the two entities is cemented on the principles of policy coordination; it facilities connectivity, barrier-free trade, and financial integration which align with the core agenda of the OBOR initiative. Trade between China and GCC has increased from slightly under USD 10 billion in 2000 to USD 114 billion in 2016. GCC is also China’s eight largest import source, as well as export destination. Further, between 2005-2017, Chinese investments and contracts in the broader Middle East were valued at USD 156 billion. Camelot’s analysis has identified an interesting correlation between Chinese investment activities in the region and volatility in oil prices. 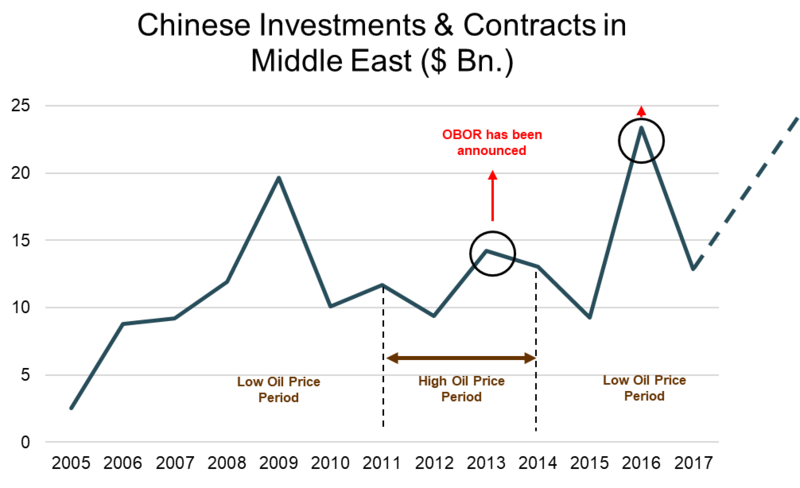 From the graph below, it can be inferred that volatile oil prices are a key trigger for Chinese investments. As volatility in oil prices is expected to be on the rise in the future, it is reasonable to conclude that this might bring in more Chinese investments into the region simultaneously. As GCC governments look to diversify their economies, attract more foreign direct investments, and increase their global market presence in the wake of low oil prices, the OBOR represents fresh opportunities for the region. In 2017, China and Saudi Arabia signed deals worth USD 65 billion involving 35 cooperative projects, with a clear majority of these being directly linked with the Saudi Vision 2030. China is also working with other GCC countries in areas that align both with their development and economic visions, as well as with its own OBOR agenda (for instance, Silk City in Kuwait). China has proposed investing in the broader Middle East region by following a “1+2+3” Sino-Arab investment mechanism which is characterized by one core (energy cooperation), two priority arms (infrastructure construction, trade and investment), and three high-tech sectors (nuclear energy, space satellite and new energy). 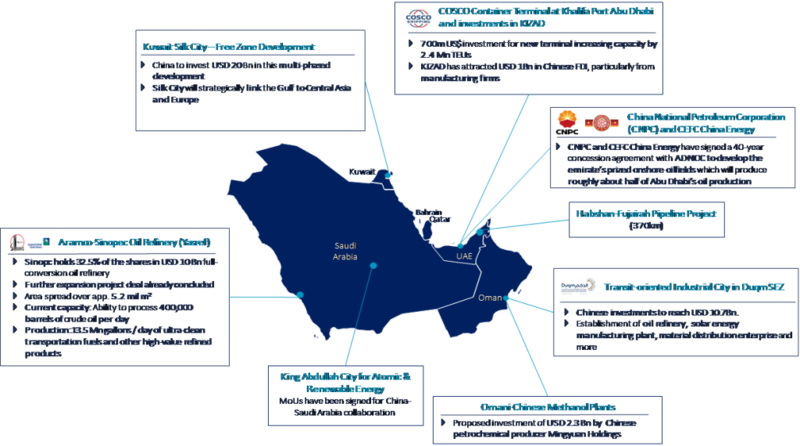 As is evidenced from the overview of the Chinese projects in the GCC region provided below, it has already set this strategy into motion. 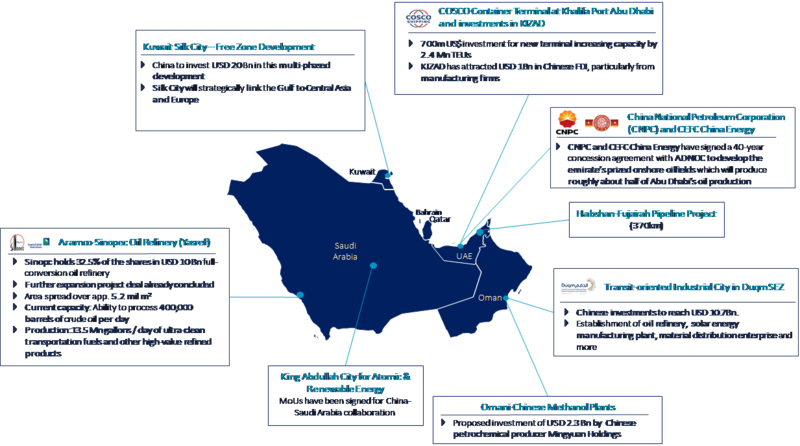 From an operations perspective, the most important Chinese investments in the GCC region is within port infrastructure and special economic zones attached to these ports. Chinese firms’ stakes within these segments represent an overhaul of regional trade value chains, corporate supply chains, and trade flows. 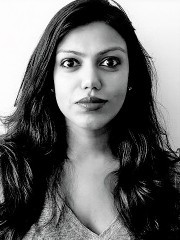 Considering this in conjunction with the China Pakistan Economic Corridor (CPEC) which sees China take control of the strategic Gwadar port in Pakistan and its investments in the Suez Canal region of Egypt, the Asian behemoth has paved multiple trade corridors that streamline the flow of goods and services between itself and not only the GCC but also Europe and Africa. Chinese investments at Khalifa Port, Duqm Port, Kuwait Silk City and along the Suez Canal region of Egypt not only helps it tap easily into the Gulf, African, and European markets respectively but helps bring them strategic advantages such as tighter control of key sea trade lanes and energy supply lanes. The positive implications of these investments are manifold for China. Assessing it from a chemicals industry perspective, Chinese petrochemicals and chemical companies operational at Duqm (proposed oil refinery), the western coast of Saudi Arabia (e.g., SINOPEC refinery at Yanbu), and Khalifa Port Free Trade Zone (e.g., Lianyungang Anlun Oilfield Chemicals Co.) will benefit from significant operational efficiencies as the primary feedstock for the manufacturing of chemicals is locally available. 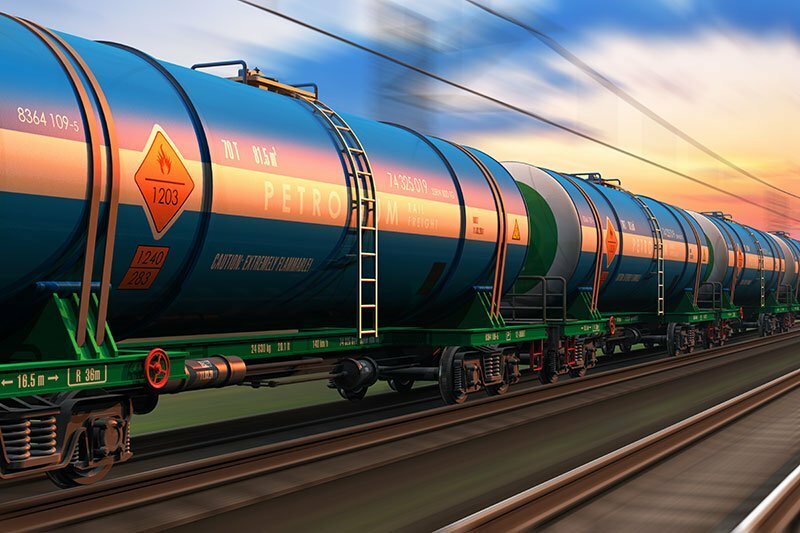 The finished products can be exported both to foreign markets and to China to help it become more self-sufficient in meetings its own chemicals requirements. China has already recognized the potential in this and has invested USD +2.5 billion in the chemical industry in Middle East between 2005-2017. Further, China has seen the benefit in relocating some of its industrial goods manufacturing operations to these hubs which again will not only help the country alleviate its domestic industrial overcapacity but is also highly efficient from global trade lane feasibility and market access points of view. 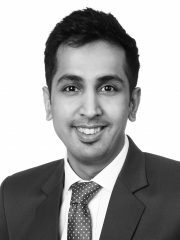 GCC economies have traditionally suffered from a dearth in manufacturing industrial activity and such investments can thus help close these gaps while injecting FDI inflows into the country. Chinese investments into ports in the region will benefit it not only from a strategy standpoint but also from the concurrent development of related maritime service offerings, and the involvement of Chinese construction and machinery companies in port construction. At the same time, this will help realize GCC countries’ vision of becoming regional logistics hubs and powerhouses. The economic ambitions of both GCC countries and China entwine well with each other which will lead to more Chinese companies setting up their businesses in the GCC. On one hand, China’s OBOR initiatives can be viewed as an opportunity by GCC governments to achieve their economic diversification and infrastructure development goals. At the same time, China views GCC as a gateway to Africa, Central Asia and East Europe. As China’s manufacturing capacities dwindle due to a plethora of social and environmental factors such as lack of local labor, environmental pollution, and gentrification of traditional industrial areas, it is scouting for alternatives along the trade routes and GCC can emerge as a strong contender in this regard. Further, local petrochemicals industries in the region can get a new lease on life and discover new markets for their products by working together with Chinese investors. Saudi Arabia’s vast reserves of crude oil will see it emerge as a key player in China’s chemical industry aspirations. SABIC and SINOPEC have already entered cooperation deal, that will see them conduct joint projects. Petrochemical players should roll up their sleeves and stay prepared to welcome the influx of Chinese FDI by strengthening their capabilities and re-designing their corporate strategies to reap maximum benefit from this impending revolution.